<Harmony-Installation-Path>/apps and create this folder structure training/middleware. Extract the ZIP file you downloaded to the training/middleware/ folder. A description of the folders found in this ZIP file can be found here. 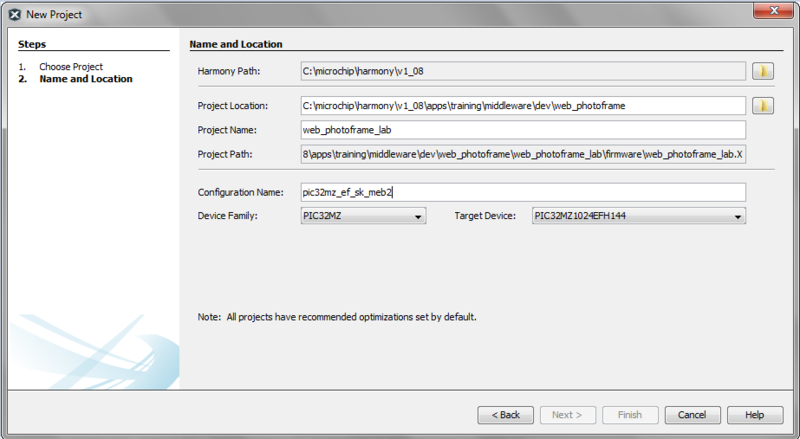 Navigate to <Harmony-Installation-Path>/apps/training/middleware and create a folder structure dev/web_photoframe. The lab will be developed in this dev/web_photoframe folder. MPLAB® X IDE will create a sub-folder web_photoframe_lab inside dev/web_photoframe. 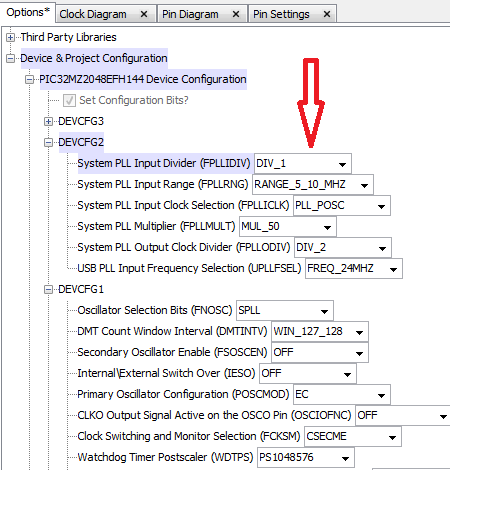 In the "Categories" pane of the new project dialog, select Microchip Embedded. 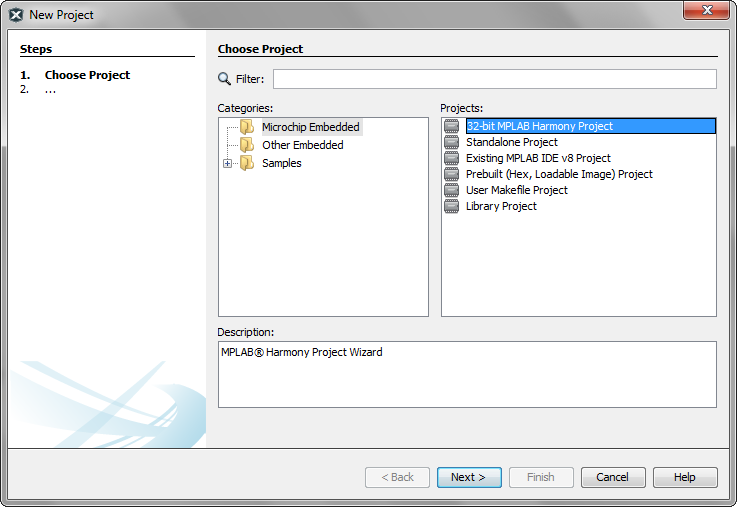 In the Projects pane, select 32-bit MPLAB Harmony Project, and then click Next. 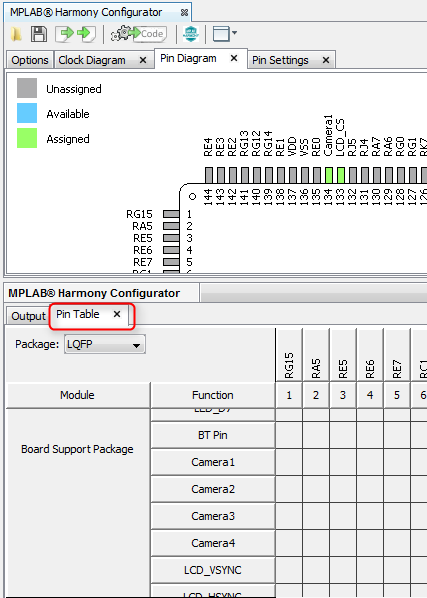 Click on the Options tab in the MPLAB® Harmony Configurator main window to select and configure the Harmony Framework in a graphical tree-based format. In the central window, under the MPLAB Harmony Configurator tab, click on the Options tab to view the MPLAB Harmony & Application Configuration tree selections. 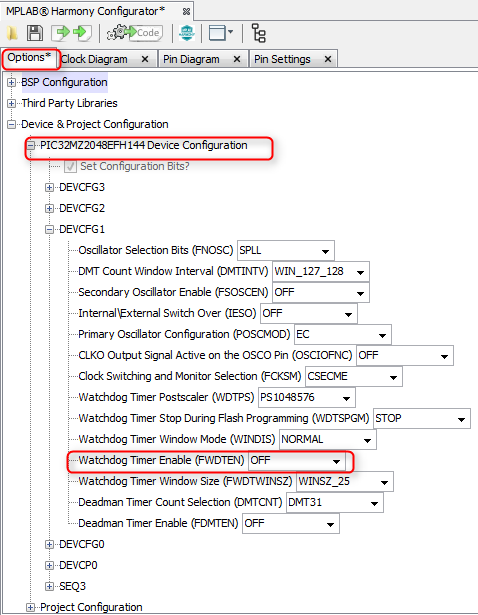 Expand the Device & Project Configuration tree, then expand the PIC32MZ2048EFH144 Device Configuration. 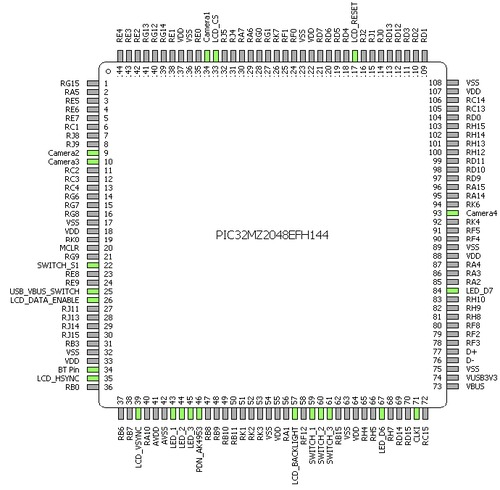 In case you are wondering where these names come from, they correspond to the PIC32 core configuration registers and bit names. Please see the device data sheet for details. The PIC32 is connected to a 24 MHz external clock input. We are not using the internal PIC32 oscillator for this project. When you change the configured clocks from the default values on the graphical interface, they are reflected as a shaded field in the Options Configuration Bits. Since the BSP selected the default values, there should be no shading. 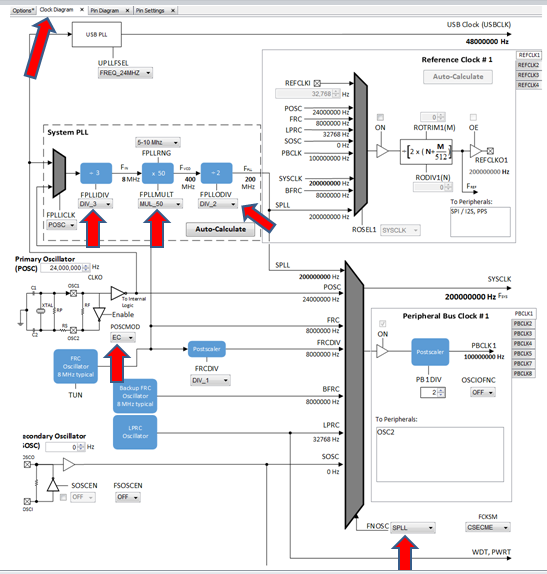 To illustrate this, notice that when the FPLL DIV is changed to a Divide By 1 instead of 3 in the CLOCK DIAGRAM graphical interface, the OPTIONS tab will reflect the changes in DEVCFG1 with shading. The BSP has already configured the PLL using the selections for the "PIC32MZ EF Starter kit \w Multimedia Expansion Board II". 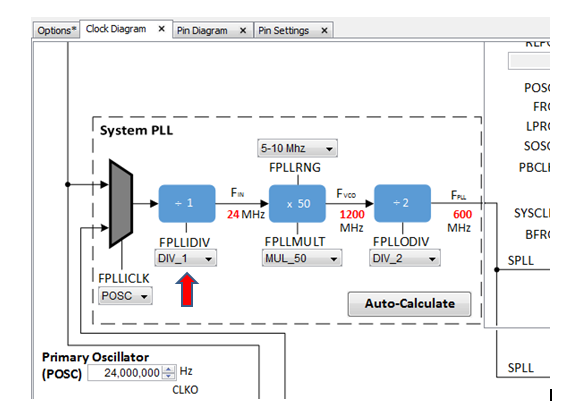 For custom boards without a BSP, you can use the PLL’s Auto Calculate feature to determine and set the PLL multiply and divide values (FPLLIDIV, FPLLMULT and FPLLODIV). You can see how this works by going back to the Clock Configurator window (Clock Diagram tab). Select “Auto Calculate” to see the pop-up window enabling you to set the desired system frequency. Note the Board Support Package has already configured this for 200 MHz. Keep this setting. Verify the Board Support Package (BSP, selected in a previous step above) has properly configured the PIC32 pins based on the external devices connected to them. You will be using the LCD Display, LEDs and Switches. Select the “Pin Table” tab in the MHC output pane (see the following screen-shot). If this window is minimized, it can be found on the bottom left part of MPLAB X IDE. Click on it to maximize it. 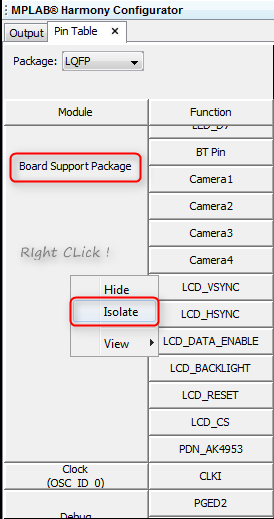 You can choose to view only the pins that are part of the Board Support Package by isolating this section. Refer to the screenshot below. 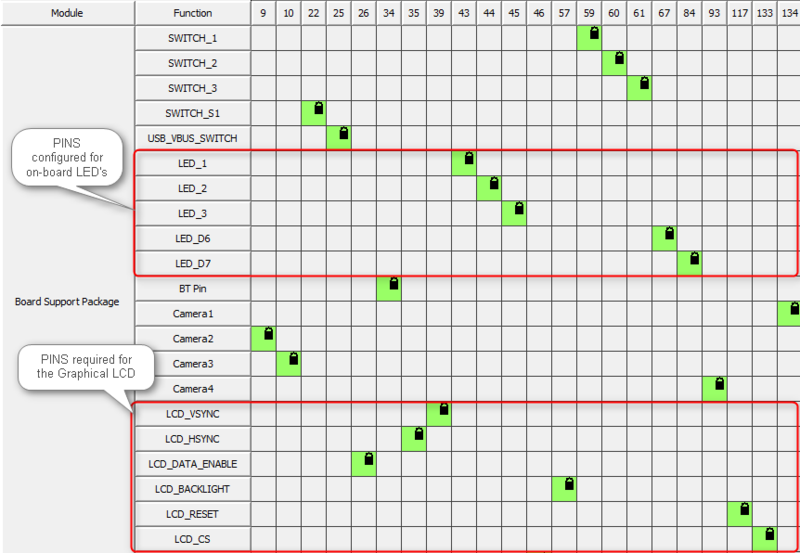 The following screenshot shows all of the pins configured by the Board Support Package. To see the pin configuration settings, click on MHC's "Pin Settings" tab.